Overwatch will be free to play for an entire week on PC, PlayStation 4, and Xbox One letting you hop into everything but the game’s Competitive Mode over your Thanksgiving break. The event just went live, and as usual, PC players can create an account and play for free while console players will need to have their respective online subscriptions to play the game. All of your progress, like earned cosmetics and levels, will be saved and carry on with you if you decide to purchase the game. Thanksgiving week also means that the game itself will likely be on sale for Black Friday. Blizzard typically reduces the cost of the game and its Legendary Edition — which includes several exclusive and pre-unlocked Legendary skins — for anyone who ends up liking the game after participating in the free trial. During the trial, you’ll be able to play everything from Quick Play to the various Arcade modes, like Low Gravity and No Limits. I’d recommend playing the Tutorial to get a feel for the game’s core mechanics and then dropping into an Arcade mode to have some fun. 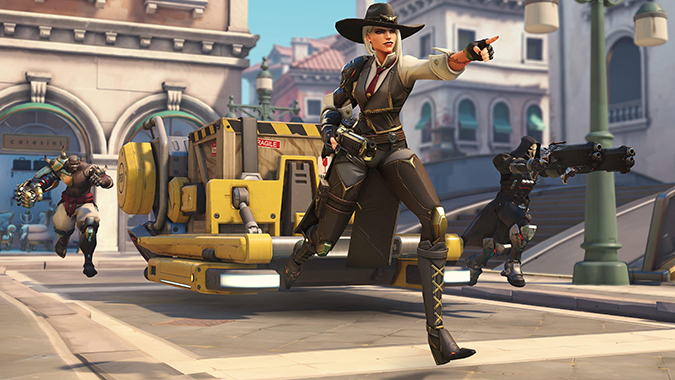 Quick Play isn’t a bad place to start either, but it might be overwhelming with how many heroes the game has at this point, including the newest addition, Ashe. You’ll also be able to grab three exclusive Ashe-themed sprays for watching specific Twitch streamers for a set amount of time, although the details for this haven’t been revealed yet. The biggest tip I like to give any new Overwatch players is to play whichever hero looks cool or cute. Of course this is a game about team composition and counter-heroes and teamwork, but it’s also a game about a really neat set of heroes that you’ll want to play as. Pay attention to the notifications on the right side of the screen during the Hero Select phase if you want to try to work with a good set of heroes, but don’t be afraid to switch and try new heroes throughout the match.